Beside taking photographs of our catches, either when being held by the proud angler or laying on the ground, sometimes it is nice to have a few action shots to show our friends and families. 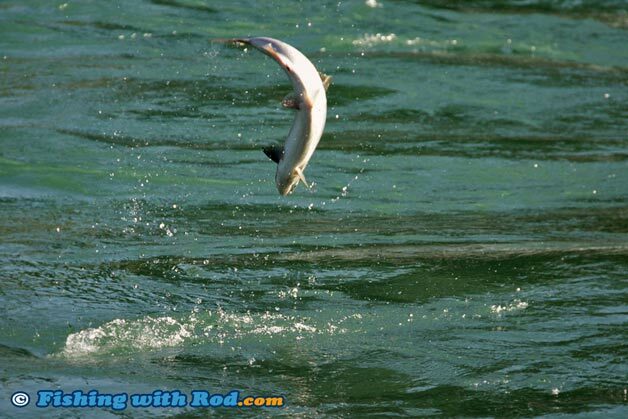 When fishing for salmon and trout, it is not unusual to see them leaping out of the water during the battle. Capturing one of these jumps on camera can be quite exciting, but it is an accomplishment that requires property equipment and plenty of practice. A fish jump happens in less than a second. Like all fast action shots, precision and speed are needed. An average point and shoot camera is not capable of managing this task, except perhaps on a really sunny day. The above photograph was take several years ago. 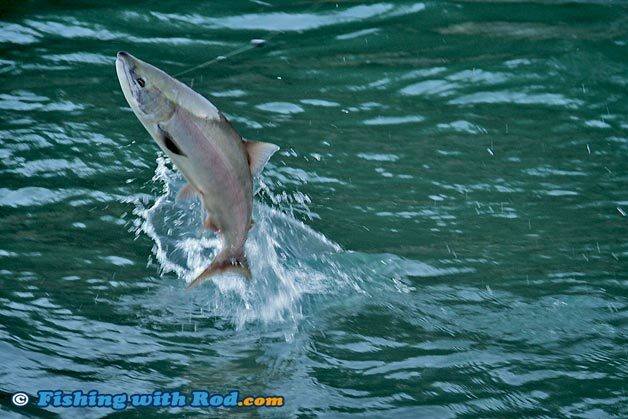 A chum salmon leaped out of the water and a point and shoot camera was used. 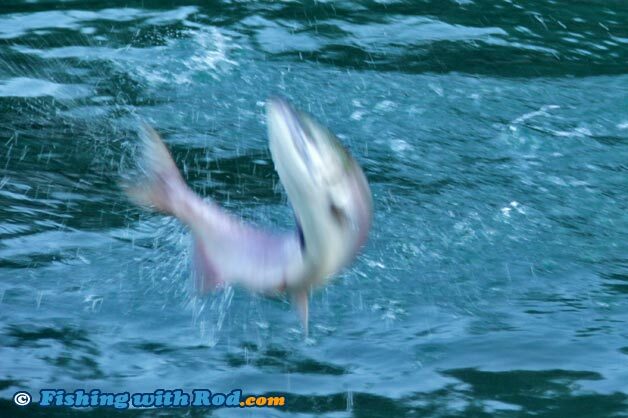 Because the shutter speed is not fast enough, the fish and the float appear to be slightly blurry. The splashes are also not "frozen". Furthermore, the camera was unable to zoom in close enough to capture the action, so the actual subject becomes quite small in the photograph. Because the subject is moving so fast, the camera needs to have a fast shutter speed. A DSLR camera which allows you to adjust the shutter speed manually is more appropriate for this type of photographs. Shutter speeds that are faster than 1/1000 second can freeze the jump, capturing a rather sharp image of the fish in the air, as well as all the water droplets around it. A DSLR camera setup, also allows you to choose your lens. 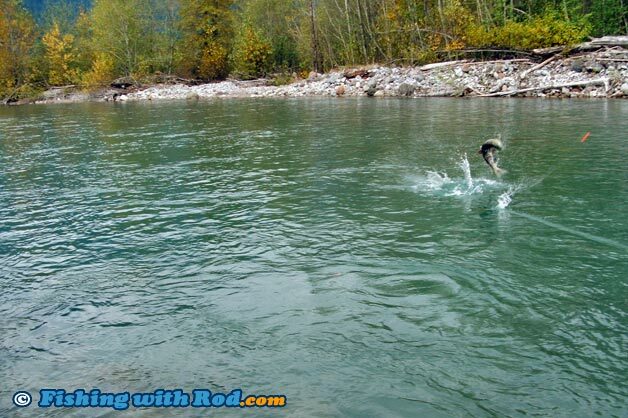 For capturing fish jumps, you really want to zoom in to where the fish may clear out of the water. A telephoto lens, with a focal lens up to 250mm or 300mm, can bring you close to the action. The above photograph was taken when the lens was completely zoomed in, however the shutter speed was still not fast enough. The fish was reasonably sharp, but the water droplets around it are still blurry. Because higher shutter speed darkens the image, these shots can sometimes be difficult to capture early in the morning or late in the day when lighting is an issue. The above photograph was taken at 6:00am. You can certainly balance it by increasing your ISO/image sensitivity to light. The photograph below was taken a few hours later in the morning, when the river was no longer shaded. The shutter speed could be increased significantly without worrying about the image being under-exposed. The result is a pretty sharp image of the fish, with water splashes "frozen" around it. Each water droplet can be seen in the photograph. It is often very difficult to predict where the fish will emerge on the surface. It can be difficult to keep the fish in the frame when it decides to show itself, especially with a telephoto lens. 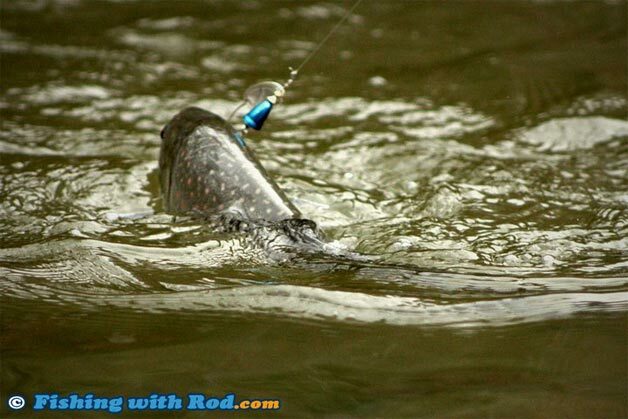 The best way to achieve this, is to follow the fishing line and focus on where it enters the water. Most likely, the fish will pop up at that spot or near it. When the fish emerges on the water surface, your finger should be pressing on the shutter button so multiple shots are taken to catch the entire sequence. Hopefully, one or two shots will be satisfactory. This takes a bit of practice and luck, so over time you should be able to capture photographs of these acrobats.